In the last few posts I’ve named a few good books about the recent rise in social justice advocacy among evangelicals. I have not even scratched the surface of the many passionate, Christ-centered testimonials that illustrate this trend. Theologically conservative, Spirit-led and Christ-centered folk who are not schooled in liberation theology or social gospel stuff are coming to a revived interest in making a difference in the world, loving our hurting neighbors, being truly “doers of the Word” in areas of creation care, racial justice, wholistic missionary work, fighting poverty, sexual trafficking and such. They are insightful, creative, and clear, sharing stories from the trenches of social service. Several of the books I told you about are good in their own right (I wouldn’t have commended them if I didn’t believe that) but I listed them also to show the breadth of the CBA publishers that have been willing to go out of the evangelical comfort zone and publish these striking voices for justice. Praise God. InterVarsity Press (IVP) has always been just about our favorite publisher, and for the almost 30 years that we’ve been at this, they have released books on creation care, global economics, being involved in racial reconciliation and such. (Not to mention the arts, science, sexuality, business, psychology, film, medicine, philosophy, but I digress.) Few publishers have been as consistently sound theologically, wonderfully releasing beautiful books about spiritual formation and evangelism and Bible study, and also showing forth the implications of a Christian worldview for daily life in the world. The influence of late 20th century giants in the evangelical tradition, like John Stott and Francis Schaeffer, largely remainds, and that gladdens me. From stuff about simple lifestyle to resources for global ministries to some very good books on urban ministry, IVP has earned the right to be considered the best publisher for reliable evangelical resources on these themes. Some of their books that help us imagine socio-economic faithfulness in these days are deeply thoughtful and provocative (think of Colossians Remixed: Subverting the Empire by Walsh & Keesmat, one of the most significant contributions to Biblical studies in our lifetime) or have offered decisive information around a particular cause (Gary Haugen’s IJM, and his books The Good News About Injustice and Just Courage, put fighting sexual trafficking on the map.) Their newly published book by Lisa Graham McMinn & Megan Neff, Walking Gently on the Earth, may be the most eloquent and insightful reflection on sustainable lifestyles yet done. Yep, IVP is simply the best. Perhaps the book that best captures the new generation’s interest in social activism comes from IVP and was just released this month. 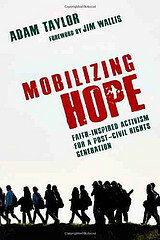 Mobilizing Hope: Faith-Inspired Activism for a Post-Civil Rights Generation by Adam Taylor tells the story of this young activist, his community organizing, his politicking, his work overseas (fighting AIDS in Zambia) and his journey to a fellowship at the White House. Taylor has this widespread experience, including a teaching assistant at the Kennedy School at Harvard, and a stint as the political director of Sojourners. Whether you would agree with all the details of their policy convictions, there is no doubt that this riveting book is interesting, striking and very important. Likewise imprint of IVP (and this is a Likewise title) promotes authors who are young, aggressive in their God-centered love for the hurting, and their willingness to live radical lives of missional fidelity; the very existence of this cool line of books is itself a bell-weather, showing the grit and guts and great writing chops of this younger generation. Every new Likewise book is worth knowing about, and this is a great example of what they are about. Mobilizing Hope is important also, as I’ve already suggested, not just because Adam is a guy whose given his life to some important causes, and has understood his discipleship in ways that led him to acts of service and outreach and protest. Other Likewise authors document this move towards service and action, but this is somehow a different caliber of work, even for the excellent Likewise posse. Young Mr Taylor has earned the right to write because he not only has given his life to social change ministry, but because he truly knows what he’s talking about. Jim Wallis of Sojourners first connected with him when he was a student at Harvard and, as Wallis reports in the preface, saw that this was an exceptional young man. 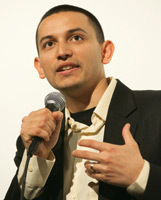 (“More than any young leader I’ve met, Adam Taylor exemplifies the best of the next generation of Christian activists.”) Not only has he worked in urban housing in NYC and in Africa and on the Jubilee debt relief campaign, he has done important projects for the Carr Center on Human Rights Policy. He founded his own mission, Global Justice. As I said, he was received into a Fellows Program in the White House. Oh, and did I say he is an associate pastor of a Baptist church? This guy is smart and savvy and effective. Adam Taylor rocks. Lastly, this new book is important because it is a younger voice. Some of us have been at this for a while, planning meetings, organizing prayer services, going to protests, writing letters to our congressman, pushing our friends who are most interested in disembodied spirituality or a-political Bible study to connect words and deeds in new ways. We’ve planned big events, we’ve done petitions, we’ve boycotted and educated, prayed and fasted, argued and learned. We’ve promoted the Wilberforce movie, we’ve paid our dues to Bread for the World, we’ve passed out Sider’s Rich Christians and John Perkins books and tried to generate interest among our friends and families. Yes, some of us have done these things, and continue to get our churches more aware and involved. This hour in history needs a dedicated circle of transformed nonconformists…the creative maladjustment of a nonconforming minority. ent of activists evolves, as younger leaders offer their unique insight and gifts and styles. live out Romans 12:1-2, and how our public square can be enhanced as we learn from social change activists who offer new vision, serious hope, gospel values, and strategies that are, perhaps, innovative and surprising. He has a chapter on “civic discipleship” and that is a very, very fresh notion. There is more packed into this–a “strategy manual” Wallis calls it—than you can imagine. Want greater steps for involvement? Want to learn some new steps towards civic faithfulness? Want to be a faith-based activist? Want a contemporary theology and spirituality—where hope is the oxygen—to under-gird your thoughts of the common good? This is the book to read. Here is a brief story at the One website with Adam talking about this book. Here are some great endorsements if your not convinced. Wonder if there’s any chance we could get Adam to speak at a national assembly being hosted in Pgh in late February? (i’m serving as local coordinator for a gathering of the Epis. Urban Caucus). If you can help facilitate connecting with Adam, i’d appreciate! Your post is very encouraging, to say the least. You mentioned that you hadn’t scratched the surface of the work illustrating evangelicals’ reawakening to the tangible needs of their neighbours. If you have time, I would love to hear more of your recommendations of books on this topic. Thanks so much! Thanks for your encouragement. At least, if you haven’t, scroll back to the previous post where I mentioned some, too. In fact, scrolling back over the last year or two will show books about these themes, most often on evangelical publishers. Send me your email address and I could compile other listings, esp if you have certain topics, causes, or issues. So glad for your comment, but it’s hard to reply as a comment, when your question deserves a bigger response.